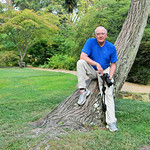 Hi, Welcome to the LGBrown Photography Web Site. I grew up in Charlotte, live in Chapel Hill, and work as an Associate Professor of Marketing at UNC Greensboro's Bryan School of Business and Economics. I am a serious amateur photographer. I have always enjoyed photography and enjoy sharing my pictures with friends. I will be posting more galleries and hope you enjoy the pictures. I welcome your feedback and questions at my email, LewGBrown@hotmail.com.